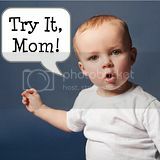 TryItMom: Every Mom Needs Flip Video! Every Mom Needs Flip Video! I used to call myself a scrapbooker. And I have a dozen beautiful, painstakingly created books from before JD was born. Before Baby O was born, I had a fear that I would never catch up enough to have a book for him, so I hired a mother's helper, spent many, many hours scrapping away, and caught up to somewhere around JD's first birthday. It was a major accomplishment. Now I have become a videographer. I have found it much more fun creating mini movies of our memories- not to mention I don't need a desk full of markers, stickers, brads, stamps, hole punchers, and scissors in every design possible. Also, I don't drive hubby crazy by saving every scrap of ticket stub, program, map, matchbook, etc. from our outings. We started a couple years ago with the original Flip, and for my birthday last year, my hubby upgraded me to the Flip Ultra HD. It comes with editing software, but I prefer using iMovie on my Mac. I use my Flip many times a day because it is small enough to fit in my sweatshirt pocket or throw in the diaper bag if I get out of the house. and funny videos about poop. You can see more of our home movies here. Please feel free to comment with links to your favorite videos. I love getting editing ideas from others!